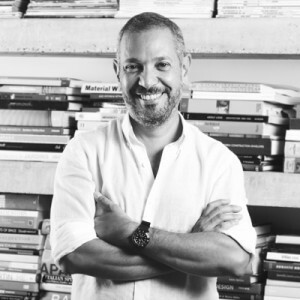 Born in Venezuela of Lebanese parents, chakib richani spent most of his childhood and young adulthood in Lebanon, where he graduated as an architect from the American University of Beirut in 1991. Since then, chakib richani and his architectural studio have been committed to producing modern designs of only the highest caliber, always seeking perfection. He has designed and realized various architectural projects in Lebanon, Europe and the Middle East, thanks to which richani gained international recognition. His buildings possess a certain poise that is rare in contemporary constructions of his region of the world. Scale exaggeration and repetition of architectural elements are partly responsible for this. There is a strong unifying concept that orchestrates the relationship of interior to exterior, the flow of the internal spaces and light, and the design and location of furniture that produce a harmonious entity. The light that penetrates into the spaces abundantly adds to the feeling of well-being. Yet they are by no means ascetic, as they are rich in proportions, scale and choice of rich materials. Spaces designed by richani, with their exceptional proportions in relation to the human scale, transmit a sense of serenity. They are a recluse where for a while- one forgets one’s ego. The viewer is not impressed by the subdued monolithic solid but by the void that is carved out of it. It’s a stage built to live in. Our objective stretches beyond the architecture to design a lifestyle. To complement these spaces, chakib richani collection was born. The items are architectural interpretations of objects ranging from vases, ashtrays and candleholders to lighting items and furniture, produced mainly in wood, marble, granite, oxidized metals, brass, bronze, and stainless steel. Each item has a name, a story, and a belonging to the richani space which inspired it. Yet, in the Boutique it initiates a life and a character of its own. chakib richani collection items are timeless works of art…to be used, displayed and treasured for always. and rich in its sensitivity. Top 100 Architects, 2010, Architectural Digest. Merit Awards, 2009, Interior Design magazine.